Lifestream Wheat Grass is a 100% pure certified organic wholesome green food made from the powdered leaves of young Wheat Grass plants. Green foods such as Wheat Grass are among the richest natural food sources of minerals, enzymes, B group vitamins, antioxidants and chlorophyll. Lifestream Wheat Grass is grown slowly through summer for around 90 days, accumulating vitamins and minerals and storing them in their leaves until they reach their nutritional peak. It is then harvested at peak potency and 'flash air dried' in minutes to ensure the living enzymes and nutrients are not damaged or compromised. This is shown by our rich Chlorophyll content, which is a good indicator for correct growing practice, high quality plants and gentle processing. We also mill our plants to an ultra fine particle size to ensure easy mixing and absorption. 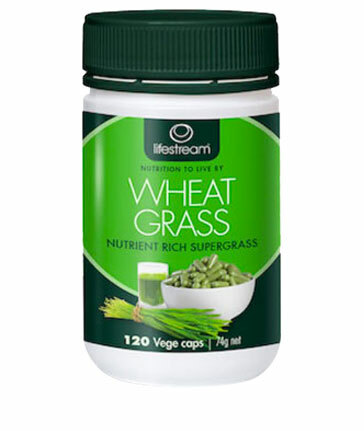 Lifestream Wheat Grass is NZ grown, 100% certified organic, vegetarian/vegan, gluten free, dairy free and G.E. Free and contains only the Wheat Grass plant. We do not use any bulking agents like corn syrup solids, rice flour or genetically engineered maltodextrin. Lifestream Wheat Grass is free of pesticides, chemicals, preservatives, additives and fillers. Adults: 4 capsules daily with food, Children: Age 5 15 yrs 2 capsules daily with food. INGREDIENTS: 100% Pure Premium CERTIFIED ORGANIC Wheat Grass Powder. OTHER INGREDIENTS: Vegetarian capsules (cellulose & water).